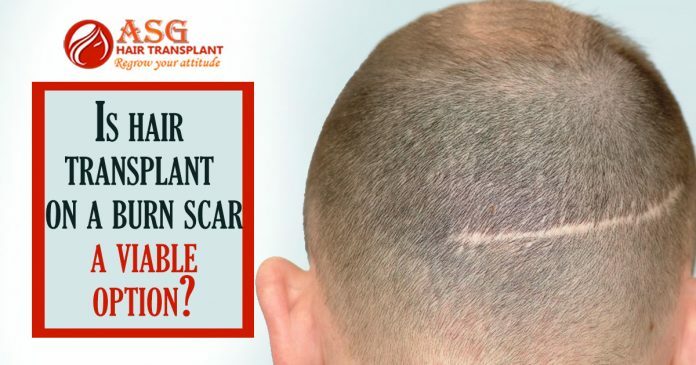 Home hair transplant Is Hair Transplant On A Burn Scar A Viable Option? The size of the burned area. If the burn scar is not treated within some months then it is difficult to perform surgery. The treatment can be done in two possible ways which are FUE (Follicular Unit Extraction) and FUT (Follicular unit transplantation). Both of the ways are same for hair transplant. The burn case may require several years to get it done properly. The treatment is performed in different stages to check whether the patient is able to respond to the treatment or not. At first stage, hair transplant is done at low density to provide the hair follicles the time for proper growth. If the treatment is effective after some years, the doctors will increase the density of the hairs. In both the treatments hair follicles are taken from the scalp where the hair growth is maximum. Because the tissues that stimulate hair growth are healthy there and it will help to treat the affected area properly. The number of grafts which are required in the treatment will depend on the case of the patient. It is not easy for everyone to get this treatment. The surgery costs around $4000 to $15000. There are many patients who cannot pay such a big amount and the health insurance rarely covers the amount. Because the insurance consider hair surgeries as cosmetic. After the treatment, you should take proper care of the affected area. Cover your scalp properly and don’t wear any satin material. In case you feel redness or itching around the area consult the doctor. The wound will get healed properly in two weeks. Make sure you eat healthy foods which will boost your immune system. Previous articleBotox Vs Ultherapy - Which One Is Better?